The age of social media and mass data has simplified our lives, removing the need to think. We are provided a serving of daily news catered to our desires. We live in a different world. Media has shifted from traditional mediums to catered servings from Google, Facebook and Twitter. 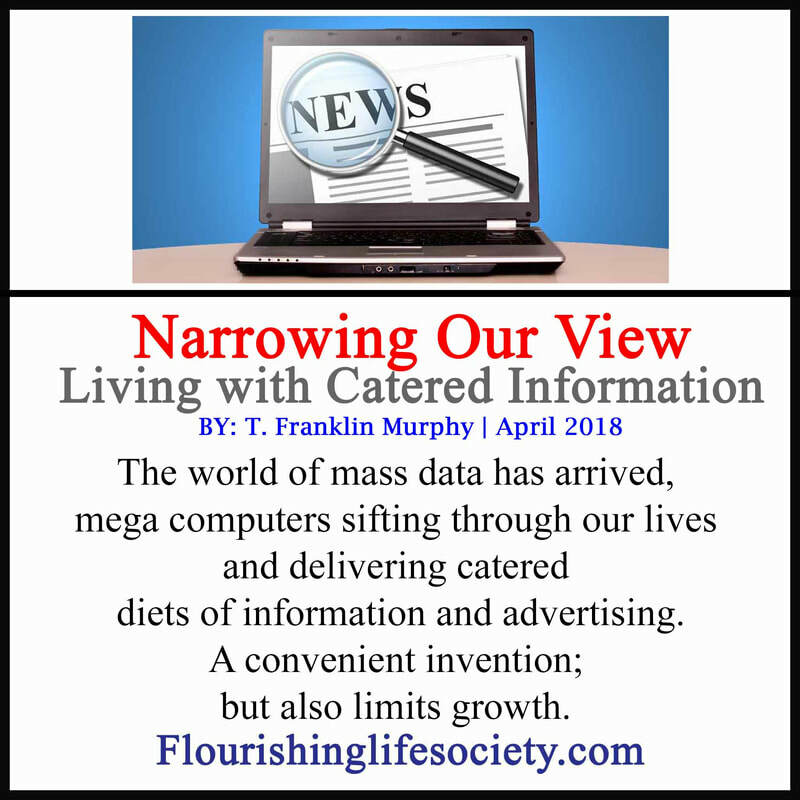 New Mass data processing shuffles through oodles of information, customizing a specialized collection that is guaranteed to pique our interest, saving us time, effort, and narrowing our existence. Truth ignores personal preferences, existing on a much larger buffet table. We must fight the machines that zero in on liberal or conservative tendencies and explore the depths of human existence. When we are open to learning, we must willingly bump against previous held beliefs. We never can know it all. Experience leaves deeply imprinted biases, many are misguided or even straight up wrong. We can allow media to sustain and strengthen those biases with customized feeds or we can expand our exposure, fighting immediate impulses of conflict for greater understanding. The most dangerous bigot is the one that believes he (or she) is above bigotry. For those are blind that claim to see; not only do they hate, but excuse that hate as perfectly acceptable, believing the different is equivalent to evil, ignorant to the proclivities of the mind, they follow vile and repulsive programing, justifying wrong by cloaking it with righteousness. I’m not an alarmist, always chasing conspiracy theories. Most fears of widespread corruptions are mostly escapisms for the feeble minded, seeking shocking excusess for an underproductive live. But the mass data era, with all its wonderful enhancements, is disturbing, not because of a corrupt government posed to take over our lives, but because of a nasty side-effect that polarizes people, creating uncrossable chasms. We must fight this, listening to opinions outside of our comfort zones, exploring alternate views, and embracing friends who think a little different. The problems of the world will not all be solved in our life time. Hate will still exist across the globe; but maybe, just maybe, we can add a little more love, a little more understanding, and a little more hope within our own spheres of influence, by keeping essential conversations alive, listening to the running dialogue of differences, and slowly finding common ground where real progress can be achieved.